Chubby arrived at the shelter absolutely terrified of everything. He'd been raised in a single room inside a house with no windows or access to the outside world. Inside the room were 15 or more cats (none of which were desexed). There was fighting when the females came into season and none of the cats had been socialised with people. When Chubby was released from his carrier on arrival he literally spent over an hour climbing the walls at full speed. He would run and hide or clamber up the walls to get away if anyone entered his cattery for weeks. Gradually Louise won his trust. He would attack any other cat that approached his cattery be it male, female or kitten because of his experiences in the room before his arrival. As time went on he was gradually introduced to the things we all take so much for granted. He was over 2 years of age before he felt a breeze on his face, grass under his feet, sunshine on his skin. He'd never seen a dog or a bird flying free. Our vets were wonderful and allowed Louise to stay with him when he went in for his vet work until he fell asleep and contacted her again before he came to so he never felt he had been abandoned at the surgery. 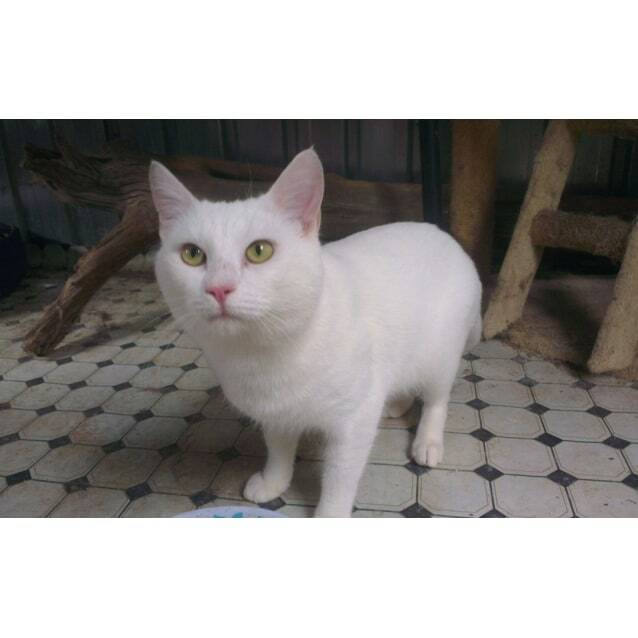 Chubby is now a wonderful, relaxed boy who thrives on attention and cuddles. But because of his rough start it will be some time before he's ready for a new start in a new home. If you'd like to help with his ongoing care costs and sponsor him, please fill in the sponsorship form and then email kittycatsnat@gmail.com.